Be and search wherever you want? Our App makes it possible. Here’s a little instruction how you can set your locations properly, to take advantage of these features. 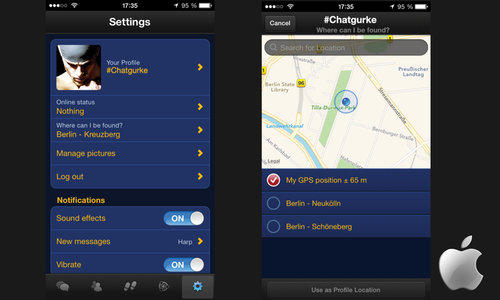 We use two locations in the App: the “Where can I be found” and the “Search in“ location. You set this to the location where you want to be found by other Romeos. You don’t have to click your heels and travel to the destination yourself; it’s far easier. Tap on the gear wheel in the lower right corner (iOS) or the upper right corner (Android) to open your settings menu, then tap on the yellow text, where it says “Where can I be found” to open a submenu with a map. Here you can choose to use your GPS location (the position you are at that moment), one of your saved locations, or enter a location in the open field. Tap “OK” (for Android) or tap “Use as profile location” (for iOS) to save. Once set, you appear in the search results of other Romeos. Go to “RADAR Search” and tap on the magnifying glass in the upper right corner. The search menu will then drop down. In this submenu you can see your “Search in” location. You can change it by tapping on the location in yellow. Within the map that opens, you can select your GPS location (the position you are at that moment), one of your saved locations, or fill out a location manually. Drag the dot on the map to choose your position more accurately. As a final step, tap “Save”. If you’re not already in the RADAR search screen, tap on the RADAR icon (fourth from left). Tap on the RADAR icon again to open a submenu, where you can find the text: “Search in”. 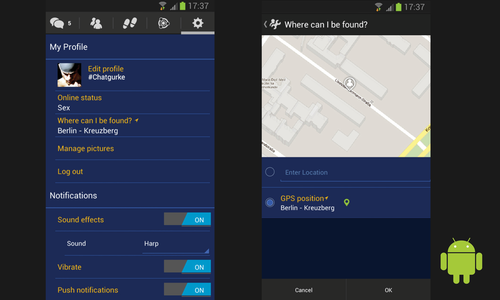 Tap on “Search in” to open the “Where am I searching” map. Within the map that opens, you can select your GPS location (the position you are at that moment), one of your saved locations, or fill out a location manually. Drag the dot on the map to choose your position more accurately. Tap “OK” to save. Easy, isn’t it? Happy dating!